An Internet Café (cyber cafe) on Phi Phi Island is a place where tourists and locals can go to gain access to the Internet for a fee. The fee is generally charged per hour or minute. Most Internet accessible places on Phi Phi Island also serve food and drinks. 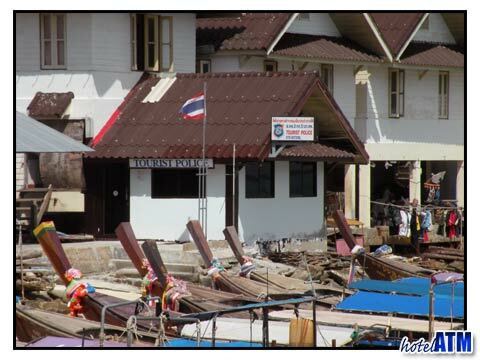 When the tsunami struck Phi Phi Island in 2004, Internet shops located along the bay and in the villages were destroyed. Many high speed Internet cafes are now back in business, because they are the main form for telecommunications for visitors to the island. Tourists depend on these internet cafes on Phi Phi Island to check their email and to carry out business that cannot be avoided. With the return of more and more tourists to Phi Phi Island since the tsunami, more and more Internet Cafes are opening on the island. Surfing the Internet on Phi Phi Island does come with a price. The average fee for one minute is 2 Baht or approximately $3. Rates are cheaper on the mainland. Obviously, the Internet Café services on Phi Phi Island count on tourists as their main customers. Locals seldom use the services. Siam UK Tours in Phi Phi Don Village near the pier has a happy hour structure where the price is half price but this is in the middle of the afternoon when you would normal want to be on the beach. The Internet cafes on Phi Phil Island also offer services like long distance calling, collect calls, call back services, printing and web camera services. Generally, a café will have five to ten workstations. Any additional services offered will also come with a hefty fee. It is also important to check on the condition of the computers, as it is well known that some can be old and slow. Most hotels like the Phi Phi Island Cabana Hotel and Phi Phi Hotel offer Internet services on Phi Phi Island and the rates may be substantially lower than in the village Internet cafes. If you are staying in a hotel that offers Internet services, they may be more up-to-date and more easily accessible than going into an Internet café. However, conflicting reports indicate that Internet cafes are the most reliable source of Internet services on Phi Phi Island because many hotels do not offer phone lines to their guests for Internet use. Some tourists also feel that the fees in hotels are actually more expensive than those at the Internet cafes.